Virginia Beach is famous for its beaches, boardwalk, nightlife, mild climate, saltwater fishing, museums, landmarks, cuisine, shopping, artists, and other attractions. Local beaches offer white sand and water suitable for swimming from June thru October. The city’s oceanfront boardwalk features an array of restaurants, cafes, bars, shops, bike rentals, and other businesses. Attractions include a variety of nautical sculptures, the most famous being King Neptune. The 24 foot bronze statue is located at the Neptune Festival Park on 31st Street. Another icon of the boardwalk is the Virginia Beach Fishing Pier. This iconic structure is a popular with fishermen, wildlife watchers, photographers, and tourists. Throughout Virginia Beach, numerous creeks, lagoons, and tributaries of the Lynnhaven River watershed provide recreational areas for nature enthusiasts, boaters, and fishermen. The ViBe Creative District is an important asset for the arts, culture, and technology in Virginia Beach. In 2015, the City of Virginia Beach established the ViBe Creative District to attract creative industries to the Virginia Beach Oceanfront. During the off season, Virginia Beach is a popular location for conventions, retreats, holiday celebrations, and mid-winter getaways. 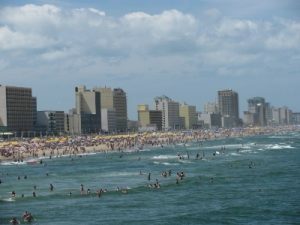 Virginia Beach is one of the seven cities of Hampton Roads Virginia.